Sometimes you write the stories, and sometimes they write you. I awoke this morning to a big, blazing Drudge headline about Texan pop starlet and American Idol winner Kelly Clarkson having endorsed Ron Paul for president. As it happens, I'm probably the only conservative political writer in America who has taken Clarkson seriously at some length (see here, here and here; I still follow her on Twitter and Facebook and the like), while at the same time following my RedState colleague Leon Wolf's magnificant series on the lunacy of Ron Paul and his campaign (see here, here, here, here, here, here, here, here, and here for lots of gory details), and for that matter I've written about the intersection of music and politics with an exhaustive look at the culture and politics of my favorite musician, Bruce Springsteen, so this story has my name written all over it. There's actually some lessons to be drawn here, whether or not you have any interest in Clarkson per se. The first point up is how Clarkson's tweets about Paul are revealing of the mindset of a lot of 'soft' Ron Paul supporters. Those of us who write about politics on the internet tend to assume that all of Paul's support comes from hard-core Ronulans, of the sort who will swarm you on the web with the kinds of barrages of talking points and - often - ALL CAPS and hate speech (or just rambling email manifestos) that carry an overpowering stench of political fanatacism. (This is a major reason why RedState has banned the Paul supporters for years; en masse, they make reasoned discourse impossible). * Even the more polite, otherwise reasonable people who support Paul in web discussions tend to be absolutely immovable in their support, to the point where there's no realistic chance they could support any other Republican. I love Ron Paul. I liked him a lot during the last republican nomination and no one gave him a chance. If he wins the nomination for the Republican party in 2012 he's got my vote. Too bad he probably won't. we shouldn't try & help/tell other countries how to solve their issues w/the poor when we can't even solve our own. I am about progress. Ron Paul is about letting people decide, not the government. I am for this. All of which sounds reasonable enough; Paul is certainly in favor of more liberty at home and a less vigorous American role abroad, and while I regard his brand of isolationism as deeply dangerous, the general concept of getting out of the UN and the 'world policeman' role is attractive to an awful lot of people who are not crazy. This is the sort of thing why I run into people - friends, family - who tell me "you know, Ron Paul has a lot of good ideas." It's also why some of the saner people in the GOP who have some overlap with Paul's ideas - from the more conservative types like Mike Lee, to Paul's son Rand, to the more libertarian types like Gary Johnson - might be better spokesmen for some of those ideas. I have never heard that he's a racist? I definitely don't agree with racism, that's ignorant. I love all people and could care less if you like men or women. I have never heard that Ron Paul is a racist or homophobe? I have never seen or heard Ron Paul say anything against gay people? I am really sorry if I have offended anyone. Obviously that was not my intent. I do not support racism. I support gay rights, straight rights, women's rights, men's rights, white/black/purple/orange rights. I like Ron Paul because he believes in less government and letting the people (all of us) make the decisions and mold our country. That is all. Out of all of the Republican nominees, he's my favorite. Sometimes I think this job will be the death of us all, or at least the emotional death of us all. Maybe that is why as a little kid in sunday school I learned that God didn't want false gods or idols. I thought it was terribly selfish of God as a child but I think I get it now. He didn't want us following people or things that are imperfect and not so much for the followers but for the gods and/or idols who will never be what everyone wishes or needs them to be because we are made imperfect. He knew we wouldn't be able to handle the pressure, the shame, the glory, or the power the spotlight brings. I just want someone that's about change, and that's what [Barack Obama] campaigned on, and that's what I'm hoping happens. I'm very much a Barack fan. How'd you celebrate the inauguration? I was actually with two of my friends here in Texas -- we were in my kitchen watching it on TV. We were crying -- all three of us. Seeing Aretha Franklin -- who in her lifetime has seen oppression and now seeing a black man become President -- sing ... that in itself is such a beautiful message to the rest of the world. A lot of people felt that way about Obama in January 2009, but the thrill is long gone, even in Hollywood. Political coalitions, of course, inevitably involve picking and choosing positions that alienate some people you might otherwise reach. Ron Paul, now 76 years old, will be gone from the stage after this election, but the challenge of how to appeal to people who like some of the themes he projects but aren't fans of more conventional Republican ideas - people like Kelly Clarkson - will persist. * - We at RedState are by no means the only people in the political sphere to notice this. For a flavor from Twitter across every stage of the political spectrum of horror at the nuttiness of both Paul and his fans, see here, here, here, here, here, here, here, here, here, here, here, here, here, here, here, here, and here. As we all know by now, there's Good Newt and there's Bad Newt. If you want the full Good Newt experience, check out this speech he gave to the NRA convention back in April. If you don't have time for the full 26-minute speech, watch from around the 5:18 mark to about the 14:30 mark. It's spellbinding. 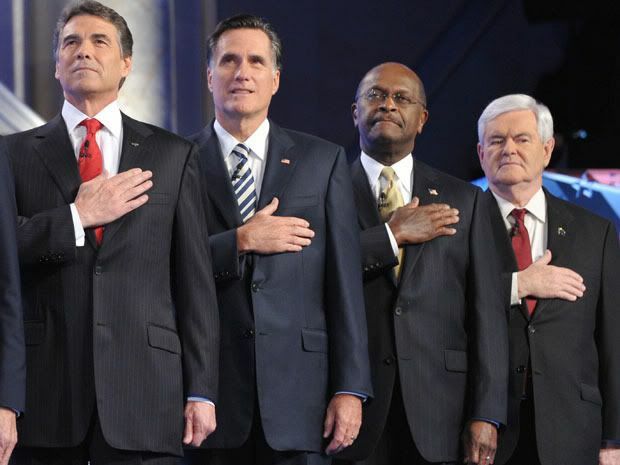 A bunch of us at RedState have a post up endorsing Perry. The faster this race gets down to three candidates (or three plus Paul and Huntsman), the better for Perry, who can lie in wait to consolidate the conservative wing of the party when and if Newt collapses. I continue to believe Romney cannot win a long two-man race against a more conservative opponent who has the money to go the distance. Elite: Time to find a new national standard-bearer, Republicans. But not somebody dumb, like George W. Bush. Grassroots: We love Sarah Palin! Elite: She's dumb. You can't have her. Grassroots: We love Michele Bachmann! Grassroots: We love Rick Perry! Elite: He's dumb. You can't have him. Grassroots: We love Herman Cain! And you're not allowed to call him dumb! Elite: He's...Ok, you got us there. But he doesn't know anything. He's ignorant. Grassroots: So, you want smart, educated, knowledgeable, good in debates? That's your criteria? Elite: Absolutely. Go find somebody like that. We have a pretty good idea what we have in mind. Grassroots: You asked for it, bro. We love Newt Gingrich, Ph.D, historian and mad scientist! We love his debating style and his enormous head and his 24 books and his moon mining schemes! He's gonna lecture you guys until you beg for mercy! Elite: We give up! We can't take it anymore! Send us back that Perry guy! We have carpal tunnel from taking so many notes! We're sick of looking up obscure battles on Wikipedia and ordering out-of-print books on eBay to do fact checking! The pages of our thesauruses are falling out! We just want to ask a simple question without having our premises fundamentally challenged! Uncle! Ideas don't run for president; people do. That's as true today as it was four years ago. So, it is understandable that much of the press and blog coverage of the 2012 GOP primary race has focused on the personalities, experience and record of the candidates rather than their ideas. In fact, until you know the candidates by their actions, you cannot meaningfully judge what their words will mean in practice. Mitt Romney is the prime example of this, having so inconsistent a record that it's impossible to take seriously the idea that he's guided by any sort of coherent political philosophy. But as it happens, we do have three candidates in this race who stand for a distinctive philosophical approach to domestic policy. One of those, Ron Paul, espouses a radical constitutionalism that exists on the periphery of the conservative movement. Rick Perry, while his issue stances are more conventionally (but not always uniformly) conservative, can best be understood through the lens of his guiding principle as a Texas nationalist - a belief that a significant amount of the powers now wielded by the federal government should be returned to the states. And then there's Newt Gingrich. Newt generates so many new ideas - he develops more firmly-held political convictions before breakfast each morning than Romney's had his entire life - that it's tempting to view them as essentially random. But there is a method to the madness. Setting aside for a moment Gingrich's personal attributes, let's look at his ideas, with particular attention to two recent interviews he did - one with Ben Domenech, Brad Jackson and Francis Cianfrocca at Coffee and Markets, the other with Glenn Beck. Both provide a keen window into how Newt views domestic policy issues. In the interests of length, I'll pass over one of the three pillars of Newt's worldview (his futurism and faith in new technologies), which has been written about extensively, and focus on two others: his gradualism and his revival of what I call "Reform Conservatism." Newt's penchant for apocalyptic rhetoric, revolutionary slogans and promises to fundamentally rethink things tends to get him branded as an agent of bracing changes; even Jonah Goldberg frames the contest between Newt and Romney as a question of whether Republican voters are in the mood for radical overturning of the status quo. The DNC has echoed this theme by calling Newt "the original Tea Partier," suggesting - as it did in the 1990s - that Newt wanted to do too much, too fast in ways voters couldn't stomach. 3. Discipline yourself to stay positive. 4. Make your fights on positive issues that are 80/20 percent; make sure the 80% is yours. GLENN: ...You said if you are a fiscal conservative who cares about balancing the federal budget, there may be no more important bill to vote on in your career than in support of this bill. This was what you said about a new you entitlement, Medicare prescription drug program. GLENN: But you believe -- no offense, but you believe voting for something that is -- you're trying to transition into smaller government by also supporting a bill that has in it a gigantic giveaway? GINGRICH: Well, you've already given away -- that's my point....you can make the (inaudible) and say, well, Medicare. A, you won't win that in the short run. So you're going to have Medicare. And the question in the short run is, so you want to have a system that basically leaves people with bad outcomes, or do you want to, in fact, maximize how long they can live and how independently they can live. GINGRICH: I think that that is too big a jump. I think what you want to have is a system where people voluntarily migrate to better outcomes, better solutions, better options, not one where you suddenly impose upon. I don't want -- I'm against ObamaCare which is imposing radical change and I would be against a conservative imposing radical change. GLENN: Okay. Yet you seem to always be -- this is long‑term individual mandate stuff. You seem to be very interested in the government finding the solution. GINGRICH: Well, let's go back to what I just said. What I was asked was if a program is unpopular, should the Republicans impose it anyway. We can go back and we can listen to exactly what I was asked on that show and what I said I stand by, which is in a free society, you don't elect officials to impose on you things that you disagree with. We just went through this slide over ObamaCare. Now, I also, ironically, I would implement the Medicare reforms that Paul Ryan wants, I would implement them next year as an optional choice and I would allow people to have the option to choose premium support and then have freedom to negotiate with their doctor or their hospital in a way that would increase their ability to manage costs without being involved, you know -- but I wouldn't impose it on everybody across the board. I think that's a very large scale experiment. But I think you could migrate people toward it. I'm proposing the same thing on Social Security. I think young people ought to have the right to choose a personal Social Security insurance savings account plan and the Social Security actuary estimates that 95% of young people would pick a personal Social Security savings account over the current system but they would do so voluntarily because we would empower them to make a choice. We wouldn't impose it on them. That's a question of how do you think you can get this country to move more rapidly toward reform, and I think you can get it to move toward reform faster. GINGRICH: ...I also think you can reshape Medicare but I think you have to do it in a way that people find it desirable and that people think -- and that people trust you. I helped reform Medicare in 1996 in a way that saved $200 billion and we had no major opposition to it. And people concluded that we had thought it through and we were doing the right thing and they were comfortable with it. ...they come back and say well, Gingrich still doesn't cut Social Security. Well, if I just fix it, maybe you don't need to. There's a book, this goes back to the '60s, there's a book called Change, Problem Perception, Problem Resolution by a group of anti-Freudian psychologists who said, instead of having you go through therapy what if we just fix your problems? Would that be okay, or would you miss not having gone through therapy? Cianfrocca: It depends on the therapist. Gingrich: You know, I think some people on the right are a little bit like Freudians in that you go in and you say I've got a brand new solution. They go yeah, but why can't we do the old solution that doesn't work and nobody will vote for? You know, well I have one that will actually work. If what [Romney] is suggesting is a mandatory premium support plan, including people currently on Medicare, he is talking about a politically impossible proposal. Which of course he can't tell you about in detail because if he told you about it in detail AARP, and 60 Plus and others would end his campaign in about three days. Domenech: You know, in terms of your critique of sort of the dangers of forcing people into this, of making it mandatory, I certainly agree with you. But isn’t the problem with that sort of an approach that you don't have predictability when it comes to the costs of the program in the future? And if you could explain to us, I'd love to hear it, why you're confident that a public option versus a private option in Medicare will bring these costs down. Gingrich:	Well, here's why and this is the only place, I mean, I think you know I like Paul Ryan...he and I talked after Meet the Press was blown totally out of proportion. What I was saying was an answer to a very specific question which was if there's a program which is very, very unpopular should Republican's impose it? And my answer is no. When we pass Welfare Reform 92% of the country favored it, including 88% of people on welfare. Reagan ran to be a popular president, not to maximize suicide. And I think the (inaudible) have got to understand, you govern over the long run by having the American people think you're doing a good job and think you're doing what they want. Now the question is, how do you have creative leadership that achieves the right values in a popular way? So, let's take the example where I think Ryan is on to something I actually support, which is that you ought to have a premium support option. I wouldn't do it in 10 years. I would do it next year, but I would do it as a voluntary program. And then I would go to the insurance industry and say to them, is there a way you could make a premium support option really desirable? Well, it turns out Medicare Advantage has 25% of the market despite the opposition of the bureaucracy. So, if you had a bureaucracy that favored market oriented systems, you might actually get to 50% much faster than you think. In short, a critical component of understanding Newt's approach is that for all his pie-in-the-sky futurism, he starts with the most conservative idea of all: taking the world as it already exists as the starting point, and needing to propose changes that can rest on a foundation of durable public support. Whether or not you agree with his judgments of what's feasible, that's a sound and canny basis for shaping legislative proposals. The second aspect of Newt's approach, and the one that explains a good number of his deviations from conservative orthodoxy, goes back to one of the great debates of the 1988-2008 period: what I referred to in 2004 as "Reform Conservatism," essentially the Jack Kemp school of thought. Newt Gingrich is nothing if not a Jack Kemp man. There are four basic points on the political spectrum. At one end you have the progressives/liberals, who think that the government should run all sorts of things - education, healthcare, transportation, business and housing finance, etc. - and trust government employees to make the important decisions. The money goes through Washington, and the decisions are made by public employees. At the other end, you have conservatives who want government out of the picture as much as possible, and want private individuals, businesses and markets to make decisions. The money and the power both remain outside the government's control. In the middle - aside from just status-quo moderates - you have two other groups. One is the neoliberals, who basically recognize that government isn't good at making these kinds of decisions, but tend to propose solutions (e.g., in the education world, things like merit pay and testing for teachers) that seek to hold government decisionmakers more accountable for results. The other is the group - whether you call them neoconservatives or Reform Conservatives or what have you - that essentially accepts the existing role of government in collecting taxpayer money for these various purposes, but wants to return the power over that money's disposition as much as possible to private individuals: school choice, private Social Security and Health Savings Accounts, etc., all containing moneys that orthodox conservatives would suggest not taxing or restricting in the first place. The lesson of Harry Truman is that presidents are about leadership not management. Presidents hire managers. Lincoln had managed a two lawyer office with no clerks. That was the sum total of his management experience before he got to be President. GLENN: But you're not into picking winners and losers. So you would not have done the GM bailout? GINGRICH: No. No, absolutely not. I think they would have -- I think they would be better off today -- remember you can have -- you can have a bankruptcy for reorganization, not for liquidation....They go through a reorganization bankruptcy, they would be much better off than they are today. GLENN: Sure. But you have selected a winner when you are for, quite strongly, the ethanol subsidies. GLENN: Why would we, why would we go into subsidies, though? Isn't -- aren't subsidies really some of the biggest problems that we have with our spending and out-of-control picking of winners and losers? GINGRICH: Well, it depends on what you're subsidizing. The idea of having economic incentives for manufacturing goes back to Alexander Hamilton's first report of manufacturing which I believe was 1791. We have always had a bias in favor of investing in the future. We built the transcontinental railroads that way. The Erie Canal was built that way. We've always believed that having a strong infrastructure and having a strong energy system are net advantages because they've made us richer and more powerful than any country in the world. But what I object to is subsidizing things that don't work and things that aren't creating a better future. And the problem with the modern welfare state is it actually encourages people to the wrong behaviors, encourages them not to work, encourages them not to study. You will not find this Hamiltonian view at any Tea Party rally you might attend. Newt's Reform Conservatism is on solid ground when it comes to tactics, and undoubtedly it involves fewer micro-level decisions about picking winners in the economy than liberalism does (with its attendant inevitable Solyndra-style abuses and corruptions) but at heart it still presents the basic problem that somewhere, someone has to decide what the "right" things are to subsidize so as to "creat[e] a better future." And it also presents tension with his desire to make real and meaningful cuts in taxes. And at bottom, it opens Newt to many of the same risks and criticisms that plagued George W. Bush's "Compassionate Conservatism." In summary, Newt Gingrich's approach can't be fully understood with an easy caricature of big or small government, status quo or radical change. What Newt stands for, and intends to carry out if elected, is a series of major changes in how government operates - done step by gradual step, introducing more popular choice and control and reducing public employment, rather than focusing on making dramatic and immediate cuts to public outlays or public functions. Newt's gradualism is an attitude that's inseparable from both his training as a historian and his obsession with the future: Newt sees change as a constant and a continuum, in which the future is reshaped by the way in which incentives are altered and power put in the hands of people who will not willingly cede it back. It is open to fair debate whether, in designing such an agenda, Newt is more realistic and more savvy in reading what is politically possible than more Tea Party oriented Republicans, or is passing up a unique historic opportunity to get the public behind razing big chunks of Washington at once. But either way, there is a distinctive philosophy at work that deserves as much attention in understanding his platform as Newt's personality, character and experience. I've got a handful of essays on the 2012 primaries in the hopper if I can ever get them finished. For those of you who aren't following me on Twitter, here's the short summary of my thinking at present. All that said, Perry's in a fairly deep hole at the moment, and realistically he may not be able to get out of it unless three things happen, none of which is all that unlikely individually, but running the table may be harder: (1) Newt implodes, (2) Romney fails to consolidate the support of the 75% or so of the voters who really don't want him as the nominee, and (3) some of the other candidates drop out so that voters are forced to look more closely at what's left. 2. I've been as surprised as anyone by the Newt boomlet, but it mostly comes down to the fact that Newt is an excellent debater, and there have been a whole lot of debates. I still think Newt 2012 is basically a bad idea, for a lot of reasons I've discussed before; I don't think he is really well-suited to be a chief executive, as streiff explains here. On the other hand, I've always liked Newt as an intellectual and rhetorical resource for the Right, and all things considered I have reached the point of having him as my second choice behind Perry, much as it astonishes me to type that. Anyway, much more on Newt to follow. If he's the nominee, he'll be a neverending smorgasbord for political journalism. The feeling may be mutual, as Ben Domenech has hilariously illustrated in the daily must-read Newt Judges You. Newt's return from the political wilderness has some parallels to Nixon, Reagan, Churchill, De Gaulle, FDR...among others. But I think the best parallel is a guy I have seen for years as extremely similar to Newt, and that's Benjamin Netanyahu. Some conservatives may object that Netanyahu is awesome, but Newt would look pretty awesome from a distance of a few thousand miles as well. Closer observers of Israel know the flaws that come with Netanyahu's toughness, eloquence and deep patriotism. 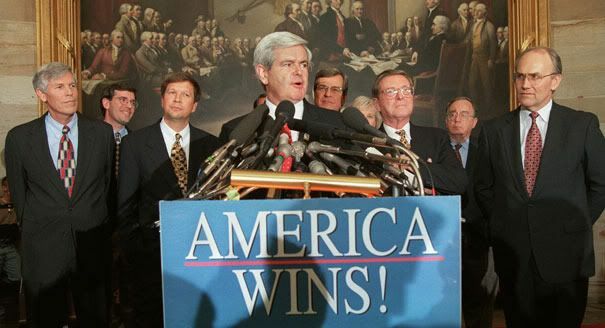 The one thing Newt has improved the most since the 1990s is his demeanor. He's much more the happy warrior than the scowling bombthrower these days. Looking back, Rudy Giuliani's 2008 campaign suffered from the fact that he had mellowed with age; some mellowing, in Newt's case, may prove a great asset. Newt is a whole lot of fun to watch do this, and for all my misgivings about him as the nominee, if that's what we come to, I intend to enjoy the ride. 3. One of the telling things to watch, previewed by his "$10,000 bet" debate line and Newt's broadside against his record at Bain, is how well Romney holds up to criticism of his wealth and business record. That's a theme Republicans have been - typically - hesitant to push too hard, but it will be the #1 avenue of attack by the Democrats, and as distasteful as that sort of thing is, we may as well see how he stands up to it now. 4. Not to lean too heavily on the work of my fellow RedStaters, but Neil Stevens explains why you should put no stock in the PPP poll showing Ron Paul within striking distance in Iowa. 5. Herman Cain's implosion will not teach the unteachable among us the perils of untested rookie candidates at the national level, but it should. I'd have gladly supported Cain for a governorship, but he was in over his head running for president. 6. Jon Huntsman has gotten a lot of second looks from desperate conservatives, partly because he's got the basics of a good resume with no obvious weaknesses (executive and foreign policy experience and a stable family as well as stuff like being tall and rich), partly because his policy proposals are really good and conservative, and his record is more conservative than people think. But we are ultimately imprisoned by our own choices, and Huntsman not only chose to abandon the domestic policy battles of 2009-10 to go work for Obama overseas, he chose to hire as his most visible political adviser John Weaver (the GOP-hating former McCain adviser who tried to get McCain to switch parties and whose termination in July 2007 coincided with the nadir of the McCain campaign) and to telegraph his disdain for conservative voters on a bunch of cultural and economic wedge issues, resulting in his candidacy attracting a vocal cheering section among people with the most poisonous of relationships with the primary electorate. (Huntsman's sneering unlikeability in debates hasn't been an asset either, nor his tendency to overrate his own sense of humor) He's the equivalent of a liberal blue-state governor launching a presidential campaign by touting his evangelical Christianity and mocking believers in evolution and global warming; that would go over like a lead balloon in a Democratic primary. The only way Huntsman could begin to repair that damage is by doing a fundamental reboot of his image, starting with sacking Weaver. His unwillingness to do that cements the suspicion that he's still at heart a rich guy from Palo Alto who doesn't much like the people whose votes he's asking for. The $28 million is the whole article; the rest is details. Apparently there are still newspapermen who talk like this. One of my longstanding hobbyhorses in baseball analysis is two related points: (1) durability/quantity of playing time matters and (2) because baseball is played in seasons, it matters to study how much a player contributed by season. For example, one of my points of disagreement with Bill James' argument in his first Historical Abstract for Lefty Grove over Walter Johnson as the best pitcher in MLB history is the failure to adjust for the fact that Johnson was frequently at or around the league lead in innings; Grove carried a less demanding workload by the standards of his own time, and won two of his ERA titles late in his career (with the Red Sox) as effectively a Sunday pitcher, starting less than 24 games a year. How often have pitchers been the best in the league (by ERA+, ERA adjusted for park and league) and led the league in innings in the same year? It's rarer than you might think - there are plenty of guys like Roy Halladay who have led the league in both, but never in the same year. Most likely because those last few innings can sometimes bring diminishing returns. What's even more impressive is pulling the feat multiple times. As it turns out, only two pitchers have done it more than twice: Greg Maddux (four years running from 1992-95, including tying Denny Neagle for the league lead in innings in 1995) and Grover Alexander in 1915-16 and 1920 (interrupted by his service in World War I, which cost him most of 1918. I discussed the monumental nature of Alexander's peak and workload in this 2003 essay. Maddux got his just a bit cheaply (1994-95 were strike-shortened schedules, in which he led the league with just under 210 innings pitched each year), but it's still a staggering achievement when you consider how far he stood above the league. The Veterans Committee elects the late Ron Santo to the Hall of Fame, almost a year to the day after his death. Here's my April 2010 column on the great 3B, which rated him #6 all time and unquestionably a worthy inductee. So yes, while the modern leader over a career with 3500 or more times on base is Kenny Lofton, both Vince Coleman and Miguel Dilone scored more frequently once on base. PS - Take another look at that list and consider how many guys above 50% batted in front of Cap Anson - I don't know where Anson hit in the batting order in the 1870s (by the 1880s, before you had to announce lineups before the game, he was inserting himself whenever there were men on base) - Barnes, McVey, Dalrymple, Kelly, Gore and Sunday all come to mind. So the Marlins have signed Jose Reyes to a 6-year, $106 million contract (with no no-trade clause). What does this mean? 1) It's almost impossible to evaluate whether it makes sense for the Mets to decline to match the Marlins' offer. As I've been saying for months now, the one piece of information Mets fans most need to evaluate the team's moves is the one we don't have reliable access to: the true financial condition of the team. Without that, everything we say is speculation. 2) That said, given the size of the Mets' market compared to the Marlins', and given that Reyes was a popular, homegrown player with strong ties to the community and (until now) a great fit with the dimensions and layout of Citi Field, it's almost certainly the case that Reyes was worth a good deal more money to the Mets than to the Marlins. Reyes' loss is a grievous blow to the Mets, who will likely be unable to meaningfully replace him in a market so short on quality shortstops (count me still a skeptic about Ruben Tejada as a hitter; at best he'll be adequate). But he may, at the same time, be terribly overpriced for the Marlins if their spending spree and new ballpark don't turn them overnight into a team able to run big-market nine-figure payrolls on an annual basis. A team with a $125 million payroll can afford to pay $17.5 million to a dynamite player who averages 120-130 games per year (Reyes averaged 133 games a year overall from age 22-28, 98 a year the past three seasons); a team with a $65 million payroll can't, because it won't have the flexibility to build around Reyes (think of the Rangers pitching staffs during the A-Rod era). And the $60.4 million payroll the Marlins shelled out in 2005 was the highest in franchise history; the average Marlins payroll over the past 19 years has been $35.6 million. Maybe that was all a multi-decade poor-me act designed to get them to the current status of having a taxpayer-funded stadium (now under SEC investigation, see here and here), but only time will tell if Jeffrey Loria is now ready to run the kinds of annual payrolls needed to justify a luxury item like Reyes, the baseball equivalent of a high-end sports car that's often in the shop. 3) Evaluating how Reyes translates into the new park is more complicated. He hit exceptionally well at Citi Field relative to scoring levels at the park, but the Mets are - in light of his departure - remodeling the place, and the new park in Florida is untested. PS - Using the metric I was playing with on Friday, Reyes in his career has reached base 1699 times as a Met, third on the team's all-time list behind Ed Kranepool and David Wright, and he's scored 43.3% of the time, or 40.4% of the time if you exclude home runs - a rate that would put him among the elite of all time. Among the Mets to reach base more than 1000 times, the only other guy above 32.5% (excluding homers)? Mookie Wilson at 38.8% (lowest was Jerry Grote at 19.7%, even below Rusty, Kranepool, Piazza and Keith Hernandez). There's no single common thread here. Most of these guys played on good offenses and/or in good offensive times, in particular in lineups with a lot of high OBPs. Many of them were excellent at getting to scoring position on their own, whether by power (Ruth, Gehrig) or speed (Rickey, Brock). Others, like Mickey and A-Rod, had both great power and, in their younger years, excellent speed. (Obviously, you could re-run this with adjustments for HRs and the like to see who scores from where they start).